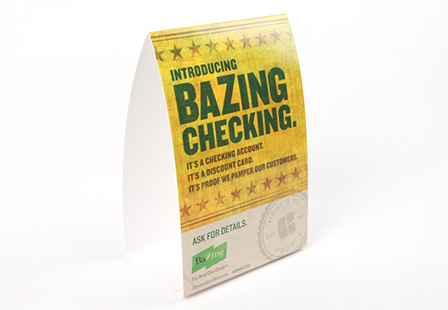 Did you know there are a variety of benefits when printing custom table tents? If placed in a great location, the Glossy UV coated table tents will allow people to see them and be interested in your message instantly. Additionally, they effectively display new menu items, special promotions, discounts, or special events at stores, bars, and restaurants. Table tents are used for business purposes, but, they can also be used as centerpieces at your next special event or party. Select from two popular sizes (4"x6" and 5"x5.5") and quantities to meet your business or personal needs. Make an impact with Glossy UV table tents! They are delivered unfolded and are scored for allowing easy folding. Please Select 4" x 16.25" 5" x 16.5"